I had to laugh this morning because if I didnt.. I would for sure need tissue. Problem is.. Maddy is in her uniform, ugh! No worries just rush home and change right. Attempt to leave the school parking lot only to get an ugly look by one of the PTO Moms . Why? Not sure. Maybe because I didnt sign up to help out with picture day. I just smile and return home. Come home and see this~ No kidding, I didnt stage this. This poor dear has been moved all over the house. Do you think someone would turn her on...NOT! I have been getting ready for another show. It's Friday and Saturday and Im almost ready. I made a few new things. These picture frames..
Everything is so pretty. I feel like a slug now!! Oh, your day started like mine did! Mine started badly at 12:15am when Caroline woke screaming! Arghhh! I have to post about mine later so you don't feel so badly! Hope the pic with Santa goes well! And the show this weekend? Wishing you a wonderful day filled with nice folks and great sales for you! Wish I lived closer. Shoot. Sounds like a busy hectic day! Hope you sell everything at the show this weekend! What a way to start your day. I love the picture frames!! Relax and take a deep breath!! I hate it when the day starts off like that but it sounds like you got it under control. I sure wish I lived closer to you cause I would be at that show for sure!!! BEAUTIFUL frames and I hope you sell out!!! I'm so sorry you are having a bad day. Good luck with the show, I wished I lived close enough to come. I want one of your signs but live to far away!!! Do you ever list them on etsy with your tassles? It is good to know everyone has days like that everywhere! Your signs look amazing! Have fun this weekend! I would bring you the biggest cup of hot coco.....but well Im a bit too far! Would love to see you in "real" life. Best of Luck...sell out!!! Hope your show goes well...wish I could be there to see all your pretties! Wishing you a fabulous show!!! 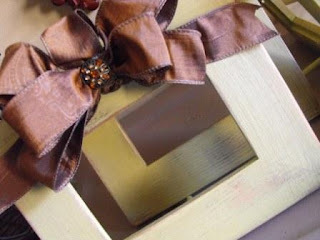 I looooove those picture frames! They are beautiful! I'm not surprised, though...everything you do is beautiful. By the way, I posted the end of the story! Susie, I am going to start sewing and crafting again after Christmas because I need to earn some money. Can you help me by telling me how you find out about the shows. I would like to prepare to do one before Easter. Not the shows you are doing but just in general how to get started. Thanks!!!! Would you believe me when I say that I envy you? You have oodles of talent and simply fabulous time management skills in order to accomplish all you do! I wish you'd share your secrets for your wonderwoman lifestyle *smiles* I bet you have a golden lasso tucked under your jacket right? *smiles* I can't get anything done! 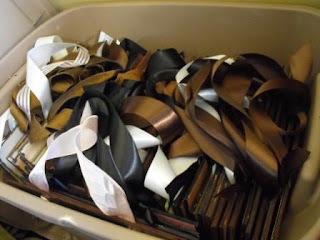 And you manage to get all those pretties made AND post on your blog about it *smiles* Some ladies just have it going on!!! No wonder that PTO lady had a snooty look on her face, she's just green with envy! Love you new goodies ~ best wishes for you show this weekend! Poor Susie! What a day you've had! Good luck with your show!! The signs are great! Forget the icky stuff and focus on how much joy you are going to bring to all those people at the craft fair! And all the people who receive your goods as gifts this Christmas. I sure do wish I could come!! 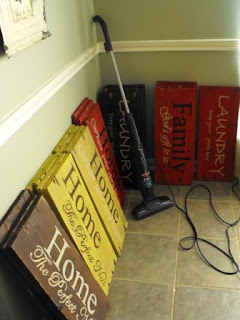 Love those signs!! I want one! Are you going to put them in your etsy shop? Please do! Drats! I am only 2 1/2 hours away, but am going out of town for my anniversary trip. Sooooo wish I could come and peruse all your goodies. Maybe next time. Depressing question- in that first picture, is that a steam mop or just a flat surface vac? Mind sharing what brand? I am constantly sweeping/mopping after my toddlers and about to go insane! Very cute stuff! Good luck! 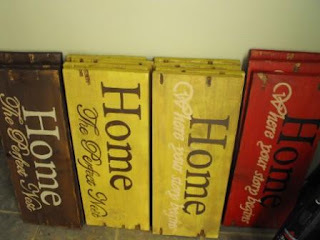 Great looking signs and frames. Good luck. Just throw out the electric vacuum broom thingy and go get a robotic Roomba!!! It will clean, even when you are not home. I wish I lived nearby. I'd love to come see you and all of your wonderful creations. Best of luck to you! Can you email me? I have a question! 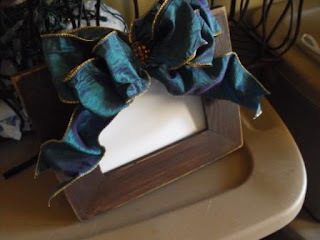 Love the frames with bows. Gorgeous! Oh those signs are so pretty and the frames look great too! I wish I lived closer to go to your show! Everything looks amazing! I want one of those signs!! I am having a giveaway! Stop by if you like! Have a great weekend and a very successful show! I so wished you lived closer to me! We would have a hoot at craft shows. We were just in Baton Rouge. You have such beautiful things...lovely!